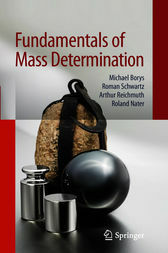 In this book on Fundamentals of Mass Determination, the definition and dissemination of units of mass is explained, starting with an introduction to metrology and mass determination. Establishing a mass scale requires corresponding mass standards and mass comparators. The metrological requirements for weighing instruments, weight pieces, and measuring conditions are explained and discussed based on international directives and applicable legal regulations. International directives and institutions are striving towards the worldwide uniform implementation of these requirements. Processes used to determine density and volume are described to the extent that they apply to mass determination. Calculating measurement uncertainty entails taking into consideration the effect of influence variables on mass determination. An overview of this topic is provided to make it easier to determine and specify measurement uncertainty in practice, while additional information in the form of tables, illustrations, and literature references allow the reader to study mass metrology further.